Indication of Compromise | Qualys, Inc. Threat hunting, suspicious activity monitoring, and malware family detection. Threat hunting relies on both advanced threat knowledge and deep knowledge of the organization's IT environment, which will also benefit the organization itself in learning more about its IT environment and finding the places where attackers can hide. 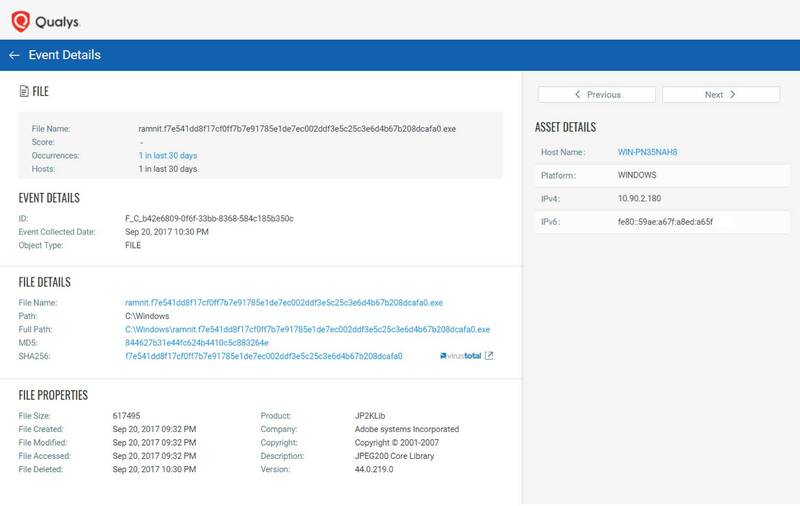 Qualys IOC uses the Cloud Agent’s non-intrusive data collection and delta processing techniques to transparently capture endpoint activity information from assets on and off the network that is more performant than query-based approaches or log collectors. Customers can use pre-defined threat hunting rules and easily import indicators of compromise artifacts into widgets, dashboards, and saved searches to quickly verify threat intelligence, scale of infections, first-infected asset (“Patient Zero”), and timeline of compromises. Threat hunting, suspicious activity detection, and OpenIOC processing is performed in the Qualys Cloud Platform on billions of active and past system events, and coupled with threat intelligence data from Qualys Malware Labs to identify malware infections (indicators of compromise) and threat actor actions (indicators of activity). 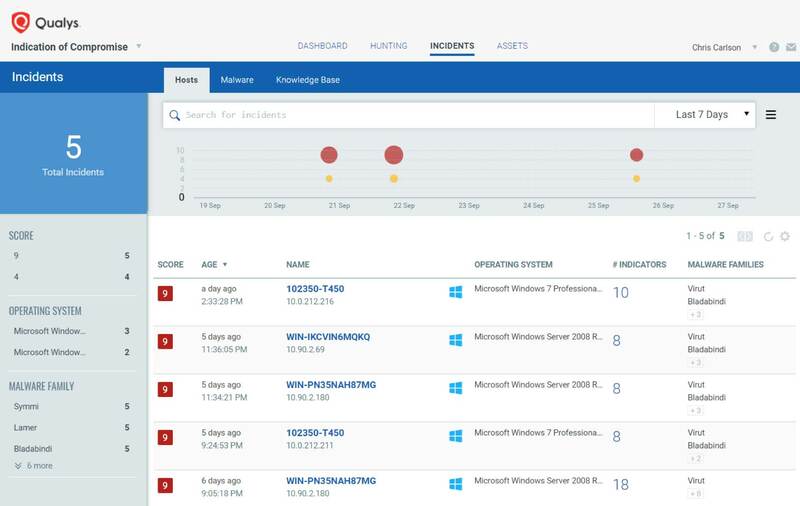 Qualys IOC creates a Single View of the Asset, showing threat hunting details unified with other Qualys Cloud Apps for hardware and software inventory, vulnerability posture, policy compliance controls, and file integrity monitoring change alerts for on-premise servers, cloud instances, and off-net remote endpoints. A single user interface significantly reduces the time required for incident responders and security analysts to hunt, investigate, detect, and respond to threats before breach or compromise can occur. Cloud Agent delta processing only sends changed events from the asset to the Qualys platform for storage, processing, and searching. Performance tuning for CPU resource and network utilization allows IOC to run on resource-constrained systems such as fixed function devices, user endpoints, cloud instances, and virtual machines. Security analysts use the web interface for offline search, hunting, and investigations, and use the visual interfaces to easily find outliers, create dashboards, and perform ad hoc querying by pivot searching across billions of events. 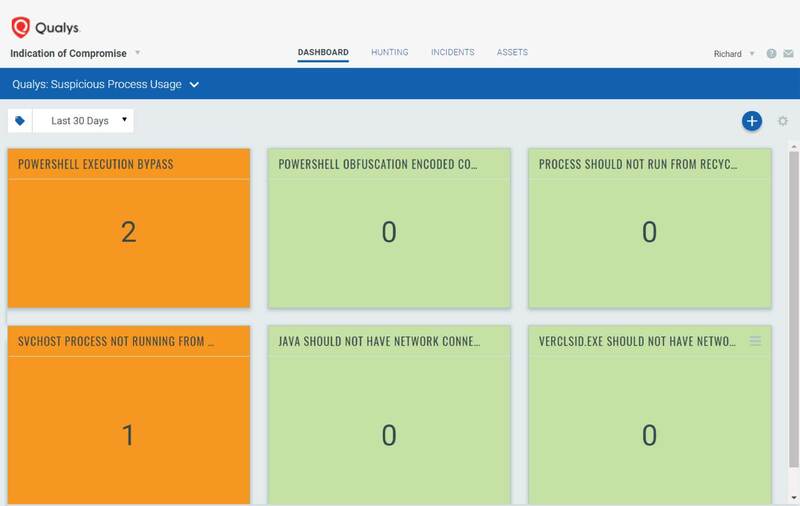 Easily verify threat intelligence reports by quickly determining if file hashes, processes, mutexes, and registry keys exist in your network. Qualys IOC time-series data search results displays currently running indicators or those that were executing in the network previously but are no longer present. Qualys Malware Labs continuously creates new behavior models using OpenIOC formats into the platform for detection against new and previous events to find enterprise-targeted malware family variants without using signatures. Most malware innovation is focused on creating new variants of existing malware families to evade detection by signature-based systems, a detection capability standard in Qualys IOC application. Automatically detect new malware family variants as new behavior models are published to the Qualys platform by the Malware Labs team. Augment existing endpoint security by detecting malware family variants that traditional approaches have missed. Identify first stage malware droppers that were prevented from executing compared to persistent, running malware that is actively communicating outside the network. Pivot to display system events occurring just before the malware infection (process execution, new files, new registry keys) to identify new exploit vectors and new infection techniques. Correlate malware infection with Qualys Threat Protection vulnerability exploit intelligence to determine if targeted attacks against your enterprises are succeeding.